Do you feel lost in the pile of papers you have on your desk? Would you like to keep all your documents organized and stored at one place? Now you can! 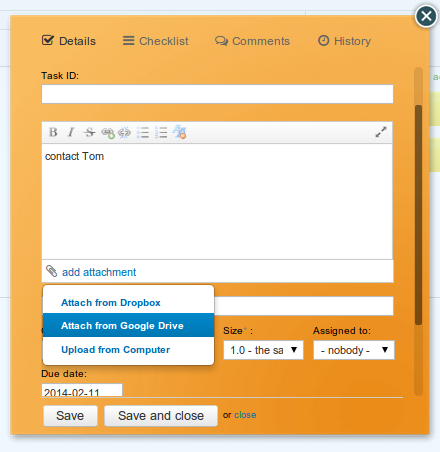 Attach your files from Dropbox and Google Drive to Kanban Tool cards and collaborate on them in real-time with other team members. Try out these new power-ups! Dropbox and Google Drive power-ups help you keep documents and tasks together. You can add files from your Dropbox and Google Drive account to any task and collaborate on them. How to start? To attach a Dropbox or Google Drive file, simply click on the "+ add attachment" link, and choose "Attach from Dropbox" or "Attach from Google Drive" from the dropdown menu. Enjoy real-time collaboration with Kanban Tool! Do you know any other great service to integrate with? Send us a hint!